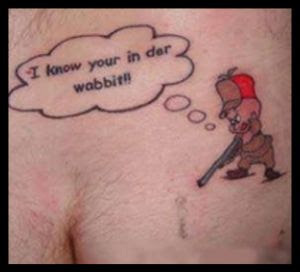 The other day I was looking back at this post and thinking about how amazingly awesome the "I know your in der" picture above is and I started wondering if there were other examples of tattoos with misspelled words or mishandled grammar. I turned to the Internets and after an exhaustive search I found the following images, each of them more face-burning than the last. Enjoy! This one has an interesting backstory. 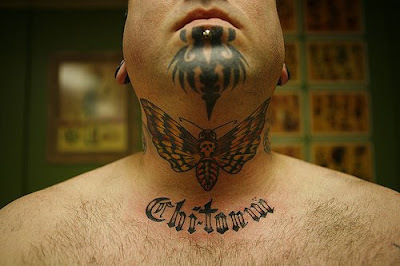 This guy was (understandably) mad at the artist for inking the word "Chi-tonw" on his neck, so he sued the tattoo shop. 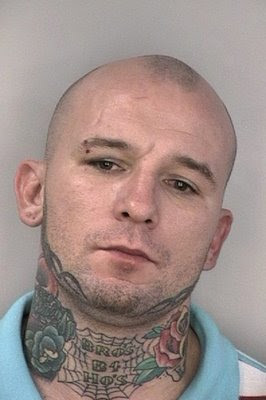 But when news of his lawsuit reached the press, the shop was flooded by other people requesting deliberately misspelled Chi-tonw tats. Actually, I'm juging you too. Misspelling aside, it doesn't know what? Maybe. But evidence is mounting that you are not. 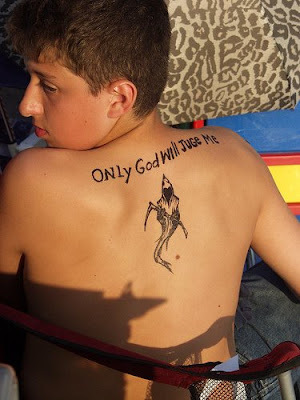 In my search I saw a lot of awesomely bad tats. Here are few non-grammar related gems. Okay, so this guy probably wasn't real handsome before, but I still think this was a misstep. 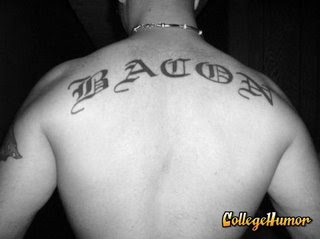 I love this tat almost as much as this guy loves bacon. Almost. 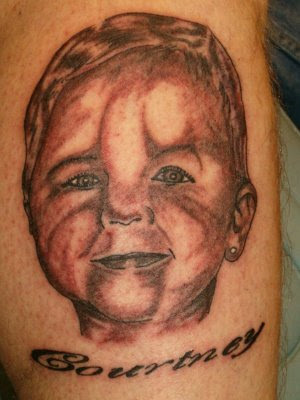 What's scarier, the thought that there's a tattoo artist this bad, or that the artist who inked this did a good job and the kid really looks like that? This takes stupid so far it becomes genius. But I do wish he weren't drinking from a bottle. Again, this rules. 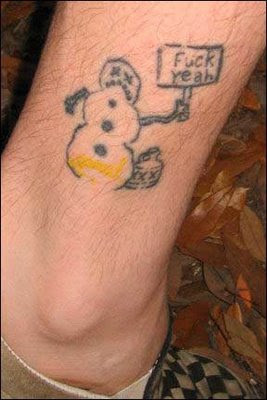 This horribly rendered drunken snowman is peeing himself and apparently loving it. 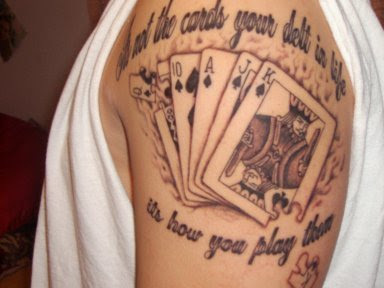 I strained every creative fiber in my being trying to devise a scenario that would result in the tattoo above and failed. 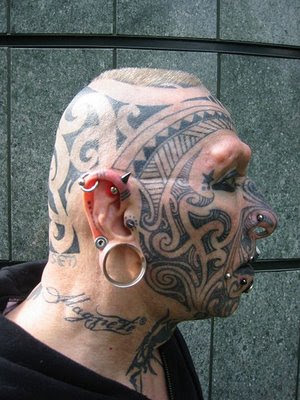 I mean, even if this guy lost a bet, what's the worst the winner could do? Kill him? 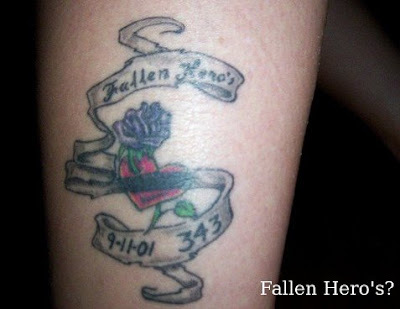 And isn't being dead better than going through life with this tattoo? 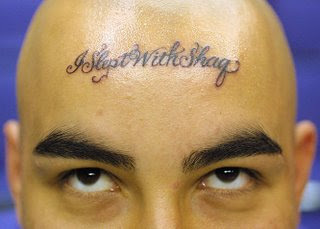 Then I looked this up and it turns out the guy got the tat TO WIN LAKER TICKETS FROM A RADIO STATION! Good lord! I assumed at least one of his children was being held hostage or something. Now I think I love this guy. 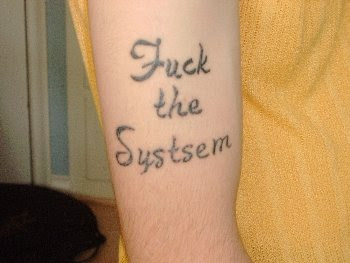 Honestly you'd think the tattoo artist would tell some of these people "What you're about to tattoo on your body is misspelled!" 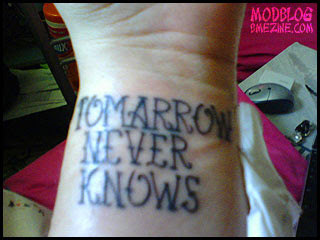 What scares me off getting a tattoo are the misspellings I've seen on signs outside tattoo parlours. 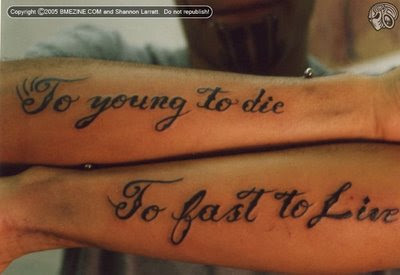 These are the coolest tattoos that I have seen for the first time and I was literally wondering to have one. 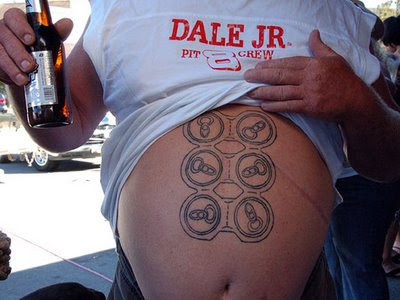 This is surely going to be a great idea to have one of them on your body.